TV advertising is amazingly effective. Madison Avenue, on its own, could not have come up with a better delivery mechanism than TV for selling a product. It’s so effective that businesses spend billions of dollars on TV ads. Half a minute during a Super Bowl game alone costs millions. Companies wouldn’t spend this much money if advertising on TV was not profitable. What makes it so profitable? It’s the lucky combination of several factors. First, let’s look at how to get a person to buy a product. There are basically three legal ways and Reward is one or them. Giving a reward for buying your product is effective to a point. Coupons, rebates, and a mile bonus toward an air line ticket for every dollar charged on their credit card are rewards. But rewards are not used on primetime TV. And, there is logic. You would think logic would be the best way. Logic is how you or I would convince a friend or family member to do something. But can you recall even one ad on primetime TV that is based on logic? I doubt it. Logic is not high on the ad man’s list. I wonder if they even consider it. So what other way is there? Suggestion. TV ads use the power of suggestion. But how can a mere suggestion impel someone to buy one brand of shampoo when there are literally 600 hundred brands that essentially do the same thing? or to buy a particular brand of aspirin when the chemical composition of aspirin is exactly the same as in other brands? The reason suggestion is so effective is a twofold. Mavens in the field claim that as much as 95 percent of your decisions and behavior stem from the subconscious mind—not from the conscious mind. If you want to get someone to buy your product, you have to plant the suggestion in their subconscious mind. What is the best way to plant your message directed into the subconscious mind? Ask any hypnotist. He or she will tell you that the person you want to influence has to be in an altered state of mind—one where they are highly receptive to suggestions. When in an altered state, your logical, critical, conscious mind is out of the way. It is not there to discriminate good form bad, or logical from illogical. A hypnotist could use any of several methods of putting a subject in an altered state. The basic idea is to distract the conscious mind or lull the conscious mind to sleep (Not really “sleep,” but there just is not a better word in the English language.) Then, when the conscious mind is not policing input, suggestions go directly into the subconscious. Boring the conscious mind so it turns its attention elsewhere. Playing a monotonous rhythmic sound in the background, such as a metronome or drum beat. Watching an emotional movie or reading an absorbing book. Or, the easiest and surest way, is to turn on the TV set. Studies have shown that individuals watching TV went into an altered state of mind within a minute. And, the type of TV program (quiz show, drama, sports, for example) made no difference. Plus, it did not make a difference whether the subject liked the program or didn’t like it. So now the TV program has you in an altered state, what tricks are used to fill your subconscious mind with suggestions? 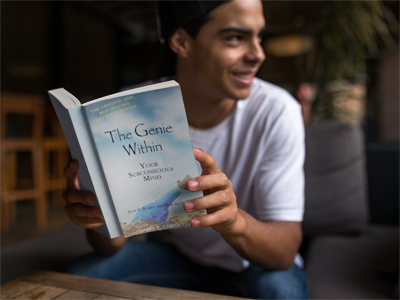 The same proven ways to plant good suggestions in your subconscious mind that are described in The Genie Within: Your Subconscious Mind. But that is the subject of a future blog. Television is a super effective way to put you into an altered state. And how convenient for the ad men because there is one or more TV in every home. Do You Have a Clue What’s in Your Subconscious Mind? Copyright © 2018 The Genie Within. All rights reserved.